Lake Pointe Inn is located in the beautiful Garrett County, home to numerous historical sites and picturesque places. When you come to stay with us, you will have the opportunity to explore one of the finest parks in the area. One of the best sites to visit when in the area is the Casselman River Bridge State Park, which is full of fantastic activities. From fishing to picnicking, you and your family are sure to have a blast at the park. Let us help you plan your trip to the Casselman River Bridge State Park. A 4-acre parcel located east of Grantsville in Garrett County, the Casselman River Bridge State Park is a popular area for fly fishermen, photographers, and history enthusiasts. Plan a day or two to explore the beautiful park and delight over all the magnificent things it has to offer! In 1813, the 80-foot single span stone arch bridge was erected. At the time, the Casselman Bridge was the longest structure in the United States. Many skeptics predicted that the bridge would collapse once the supporting timbers were removed. Impressively, the bridge stood and served as an important link on the National Road from 1813 to 1933. The bridge no longer carries traffic; however, it is still open to pedestrians. 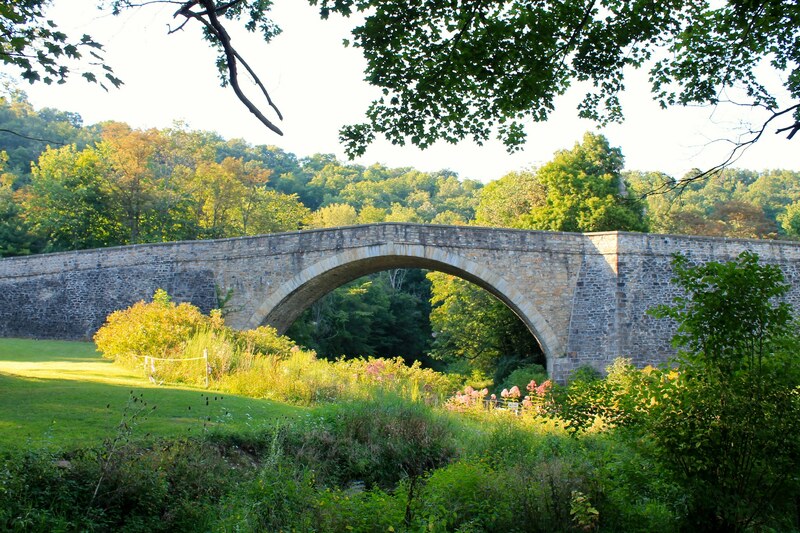 Stroll across this historic bridge while enjoying the picturesque countryside of Maryland! At the foot of the stone bridge lies the Spruce Forest Artisan Village, which is comprised of historic buildings moved to the site from various locations in Western Maryland. Adjacent to “Spruce Village” is the Penn Alps Restaurant, a historic building that dates to 1818, and the Stanton’s Mill, a working gristmill originally established in 1797. Make sure to bring your camera along! Visitors will have ample opportunities to capture the beauty of the area when they wander through the stunning state park. The Casselman River was formerly known as the Little Youghiogeny River. The fifty-six mile-long tributary of the Youghiogheny River is located in western Maryland and Pennsylvania. Part of the river is located in the Casselman River Bridge State Park! Fishing in the Park is a fun way to spend one of your days while in the area. Fly-fishing for rainbow trout at the Park is a fantastic experience! The Maryland Department of Natural Resources stocks the Casselman River regularly with adult size trout, with some exceeding five pounds! Before you hit the river, make sure to have the necessary license. As you are planning your trip to the Casselman River Bridge State Park, make sure to book your room at Lake Pointe Inn. Our McHenry, MD, bed and breakfast is the perfect place to stay during your adventures in Casselman River State Bridge Park. Our rooms and suites have cozy amenities like gas fireplaces and luxurious furnishings, ideal for relaxing after a day in the State Park. Every morning we will serve you a delicious hot breakfast that will fuel you for your explorations during the day. Staying at Lake Pointe Inn will make your visit to the Lake a memorable experience. We can’t wait to see you soon!